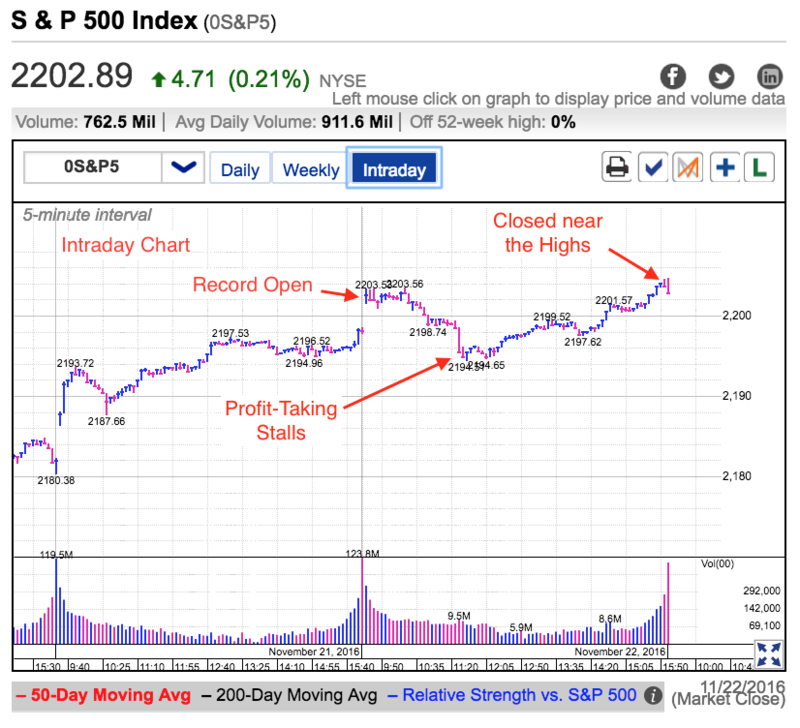 Wednesday morning the S&P500 rallied to all-time highs shortly after the open. Oil popped 10% when OPEC finally agreed to cap production and the ADP payroll number came in far stronger than expected. But the enthusiasm was short-lived and the market retreated from those highs in a relentless selloff that saw us close under the psychologically important 2,200 level. Volume was off the chart and only exceeded in recent months by the two-trading days following Trump’s unexpected election. While November had a heck of run from the pre-election lows, this week’s poor price-action has been far less confidence inspiring. We rallied to record highs during the low-volume Thanksgiving week, but the market has been behaving poorly ever since. The last three-days has seen significant givebacks in the final hours of trading. That tells us big-money investors are far more inclined to take profits near all-time highs than they are to add new money and chase prices higher. I’ve been quite bullish and expected the market to rally into year-end. We’ve been consolidating since mid-summer and the market refused multiple invitations to breakdown. When the market doesn’t go down on bad news, look out above. But this morning’s pathetic price-action forced me to reevaluate that outlook. Today’s bullish news was more than enough to unleash a flood of buying when we opened near record highs. If the market was a coiled spring ready to explode higher, this would have triggered that move. Instead we hit our head on the ceiling and fell into tail-spin. There are few things more ominous than a market that cannot rally on good news because it tells us we are running out of new buyers. It looks like we’re stuck in a market that won’t break down on bearish news and won’t rally on bullish news. Owners are stubbornly clinging to their stocks and won’t sell negative headlines and price-action while those with cash have zero interest in chasing prices near record highs no matter how “safe” the market feels. Entrenched views like this are what trading ranges are made of. The longer we stay inside the range, the more stubborn both sides become. But this building pressure also means when the dam finally breaks, the resulting move will be swift and decisive. Don’t get me wrong, not ready to call the bull market dead, but this week’s poor price-action says we are not ready to extend the breakout into record highs just yet. 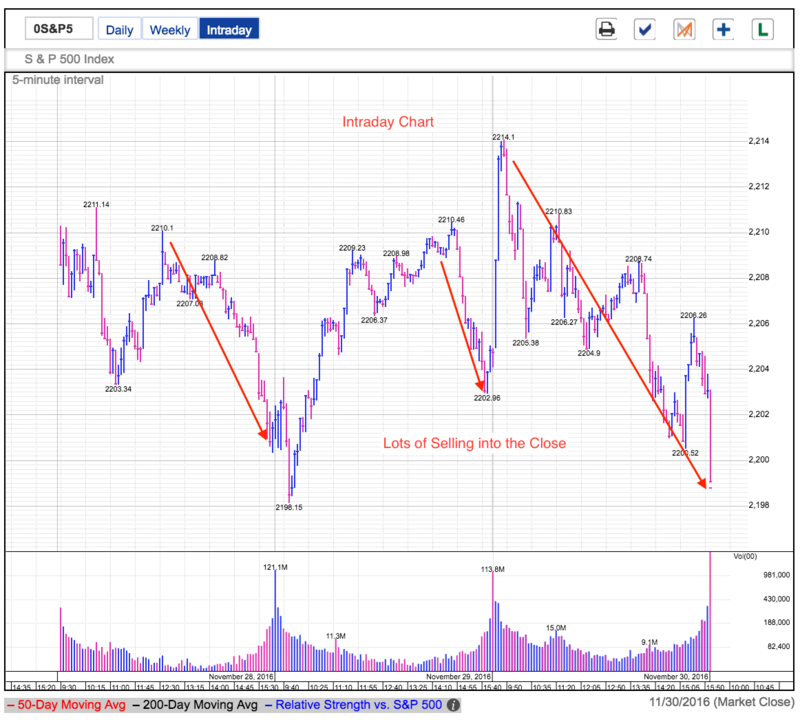 The market was getting a tad frothy following the straight-up move from the November lows. A step-back here would be a healthy part of building a sustainable foundation for the next leg higher. A high-volume dip to 2,180 would flush a lot of excess enthusiasm from the market. If prices bounce and reclaim 2,200 not long after, that tells us bulls are still in control. On the other hand, if the losses accelerate through 2,180 and we cannot find a bottom, the 200-dma and 2,100 are very much in play. Right now the pressure is on Bulls to prove they are still in control and that is what we need to watch over the next few trading days. I took profits defensively this morning when we couldn’t add to the early gains, but I am more than ready to jump on the next trade when it shows itself. The price-action over the next couple of days will tell me if that is shorting this weakness or buying the dip. Why this breakout is the real deal. The S&P500 poked its head above 2,200 for the first time in history. This is a level we’ve been flirting with since mid-summer and while it took nearly half a year, we finally did it. Now that we’re here, question is if this rally through the upper end of the trading range is the real deal, or if it will fizzle like every other failed breakout over the last six-months. The GOP takeover continues to be the fuel propelling this 100-point rebound. While there was pre-election apprehension over what a Trump presidency would look like, so far investors are clearly excited about the prospects of a business friendly administration. This is a significant and unexpected development that has the makings to be the catalyst that drives us out of this trading range. While this week’s price-action has been constructive, we have to remember this is a holiday shortened week. Big institutions know volume is typically light and they cannot move big blocks of shares, meaning they made most of their important trades last week. Most of the trading going on this week comes from smaller and less meaningful traders. Without big money’s guiding hand, these little guys throw their weight around and can boost volatility, but their limited size means they don’t have the money to drive directional moves. And so while I like this week’s price-action, we won’t know the market’s true intentions until next week. That said, it was encouraging to see how the market responded Tuesday on an intraday basis. We opened above 2,200 but cynical profit-taking quickly pushed us under this psychologically important level. But rather than trigger a wave of follow-on selling, supply dried up and we rebounded back to the opening highs. That tells us most owners are more inclined to continue holding than take profits. Their patience and conviction is keeping supply tight and propping up prices. We’ve seen a lot of churn during this half-year consolidation with nervous and pessimistic owners being replaced by buyers expecting higher prices. This core group of owners has ignored every excuse to breakdown all year and it was inevitable we would make a run to all-time highs. Now that we’re here, there is little reason to think they will give up now. Smart traders keep doing what is working and right now that is betting on the market.